This recipe comes courtesy of the kind folks at the Montefiore Institute (little Synagogue) in Calgary. I picked up a copy at Heritage Park in Calgary while visiting my good friend, Sue. She and I went with her mom. Alice, and had a lovely time enjoying their Once Upon a Christmas festivities. Chanukah happens in December. (For more info, click on the link.) The tradition is to cook foods that are fried in oil to remember the miracle of the little jar of oil that burned for eight days. The most common Chanukah foods are latkes and special jelly-filled doughnuts, but these can be enjoyed at other times as well. Enjoy! Peel and cut two of the potatoes into one-inch (2 cm) chunks. Boil in salted water until tender. Drain and mash smooth. Sprinkle matzoh meal or flour on top. In a large bowl, shred one large onion, then shred the other two potatoes into the onion to keep the potato from discolouring. Squeeze as much liquid as possible from the onion-potato mixture. by placing the shredded vegetables into a piece of cheesecloth and twisting until no more liquid can be extracted. Return to large, dry bowl and add eggs, pepper and salt. Add the masked potatoes to the shredded potatoes and combine thoroughly. Form into palm-sized patties that are about 1/2 to 3.4 inch thick (about 1 cm). Fry these patties in 1/4 to 1/2 inch corn or canola oil (NOT olive oil). The patties will need to cook for about five minutes on the first side, so if they do more than go slightly brown after a minute or two, your oil is too hot. 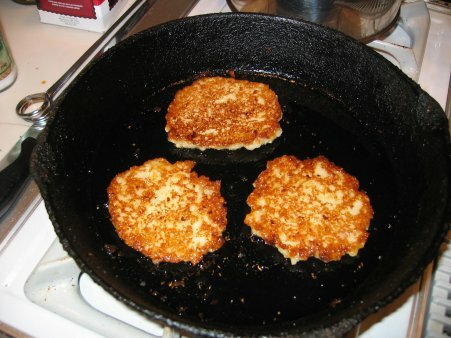 Turn the latkes after five minutes (or brown) and cook on the other side for about two minutes or until dark golden brown. Drain thoroughly on paper towels or newspaper. Serve with sour cream and/or applesauce.